Writing a report is normal for students in elementary, high school and even for college. 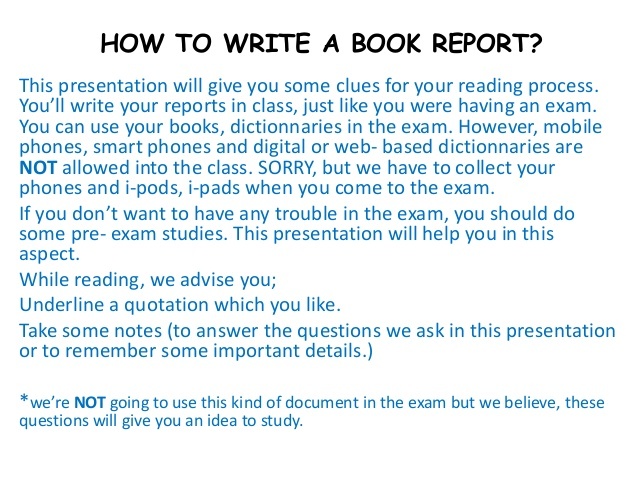 Although there are many different kinds of reports that will be asked by the teachers to be submitted by the students, there will always be that one kind of report that is common all throughout your entire school life, and that is a book report. In elementary, you are typically given a specific format to follow so that it will be easier for the teacher to track as to whether the student is following the instructions or not. 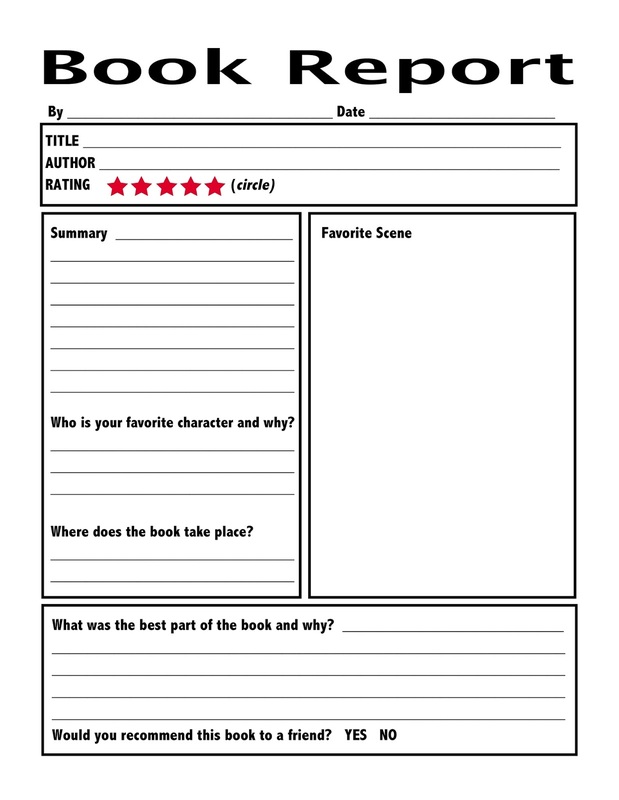 This format is also useful in helping the students with how they should organize the structure of their book report, from beginning till end. There are many ways of preparing your report. But, it is best if you follow these steps listed below as it may make your life a lot easier. You may also see the report writing examples to give you a better idea. 1. Follow the Requirements of Your Assignment. Even though you will be exercising your own creativity in this book report, keep in mind that there are still instructions that should still have to be followed. If there are any clarifications or questions that you would like to raise to your teacher before beginning the assignment, it would be the perfect time to do so. You may also see free report examples. 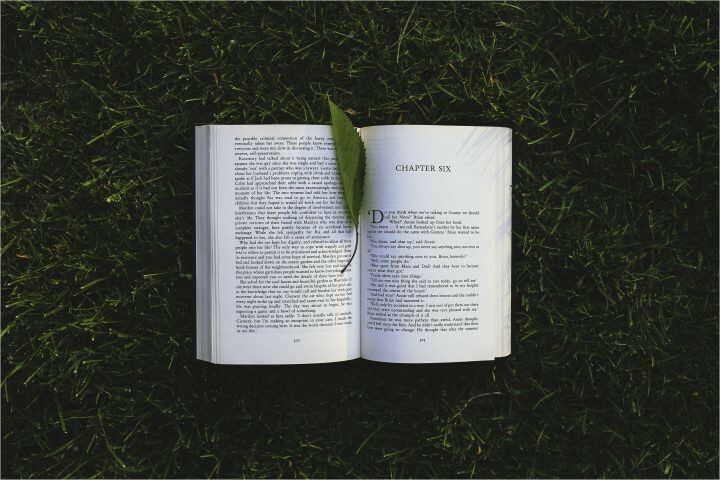 One of the things that you would need to clarify with your instructor is whether citations and page numbers are necessary items to be added in the book report. Try to ask your instructor on how much of the book report should be dedicated to the summary of the story. After all, most book reports are direct summaries with only a few opinions mixed in. You may also see incident reports. 2. Read the Entire Book. What’s the point of writing a book report if you know nothing about the book itself? If you are more visual than imaginative, I would suggest you watch an adapted screenplay of the said book in order to cut down the “boringness” you might feel when you read it. But, keep in mind that movies (no matter how well-told) will always leave out some details or scenes that are found in the novelization. But then again, it is entirely up to your discretion. You may also see monthly reports. If you have the ability to read without getting bored, then I would suggest you read the whole thing in one go to keep the momentum going. If you need a break or need to eat, then do so while reading if it is something impossible to put down even for a second. Do not even think about skimming the book. Capture the moment of the scenes being offered to you. Read about every detail and allow your imagination to take flight. You may also see activity reports. Last but never the least, allow yourself to never read book summaries online. They can never be trusted. You will never know what they might have left out. It is better if you commit time to reading the whole thing than being a killjoy. 3. Take Careful Notes when Reading. If there is a specific plot twist that gets to you, write it down. If there is a scene that created a huge impact, write it down. If there is a character that you can relate to, write it down. Write down what you like. Write down what you hate. Take notes while you read them. If you do not want your momentum to be ruined, you can always go back to it when you are done. You may also see formal reports. When you are finished with your outline, go back through it to see if it makes sense. Reorganize and restructure the whole outline if you have to. Do not forget that this is just a guide for you, and it can be changed. Outlining does take a bit of time, but it will save you time in the proofreading stage. You may also see book reports. An outline does not have to be too complicated. It can even only be a couple of one-liners from the story so as to give you the gist of what you need to include in that certain area. Indicate what each paragraph will discuss and the details from the work that you’ll include. Outlines can change from time to time. You may also see short reports. Intermix Examples and Quotations from the Text. As you construct your outline, try to pair any general points of the summary with specific details from the book. This will show your teacher that not only have you read the book, you understand it. Vary your examples and keep your quotations brief. You may also see expense reports. This is probably both impossible and improbable for two reasons. First, if you attempt to cover everything in the story, people might as well just read your book report instead of buying the book itself since the plot and everything else is already explained. And second, there is a tendency that you might leave out some important details in the process, even if you have covered everything. This is just a summary. You may also see service reports. For example, you’ll likely need to focus primarily on discussing the most important characters or the characters that appear most frequently in the text. Start strong and end strong. First impression matters, so make it count. If you are still in elementary, then it is best not to try too hard at making an attention-grabbing sentence. But, if you are in college or high school, you might be able to think of something. But it is important to include the author’s name and the book title in the first paragraph. You may also see management reports. Try not to take up too much space with your introduction. It should be more than two and generally less than ten sentences long. This is a great way to start the body of your paper because it will set the stage for everything else that you’ll discuss in your report. Describe the locations mentioned in the book so that your teacher will know exactly what you are referring to. You may also see status reports. Add color and life to the summary. If the place was smelled like the stench of death and decay, by all means, add it there. This is where you need to describe the exact outcome of the book in less than two paragraphs. The plot summary should mention all major events that took place and how each event impacted the characters. You may also see performance reports. The book revolves around its characters (both protagonists and antagonists). Make sure when you are describing your characters, give every detail on how they look like, their actions and the skills they possess. You may also see investigation reports. Look for the ‘big ideas’ as you are reading. In a fiction work, pay attention to the character’s actions and how they follow certain patterns if they do. In a nonfiction work, look for the author’s primary thesis statement or argument. What are they trying to prove or suggest? For example, you might write, “The author argues that travel gives you a new perspective. That is why her main characters all seem happier and more grounded after visiting new places.”You may also see recruitment reports. For a fiction work, watch to see if the author is using the story to pass along a certain moral or lesson. For example, a book about a fictional underdog athlete could be used to encourage readers to take chances to pursue their dreams. You may also see medical reports. 6. Comment on the Writing Style and Tone. Different writers and authors have different personalities and have different writing styles. If you think that the author was sort of informal or too casual when he wrote the book, note that down. Language is considered a vital aspect of writing a book, depending on who your audience is as well. You may also see consulting reports. Start strong and end strong. When everything else is forgotten, at least the readers have something they can remember from your summary. Include a few quick sentences summarizing the entire book. You can also make a final statement about whether you’d suggest the book to other readers and why. You may also see visit reports. Don’t introduce any new thoughts in this final paragraph. Save the space for your recap. Double check the content of your paper to make sure everything is intact. Typos, grammatical errors, punctuation marks. You can also try to read your paper out loud so that you may be able to identify some points that you are missing. You may also see sales reports. 3. Polish Your Final Report. Once you’ve made the necessary corrections, print out a clean version of your report. Read through it slowly and carefully. Look for any typos or minor errors. Compare your report to the guide sheet to make sure that you’ve followed all of your teacher’s directions. You may also see project reports. 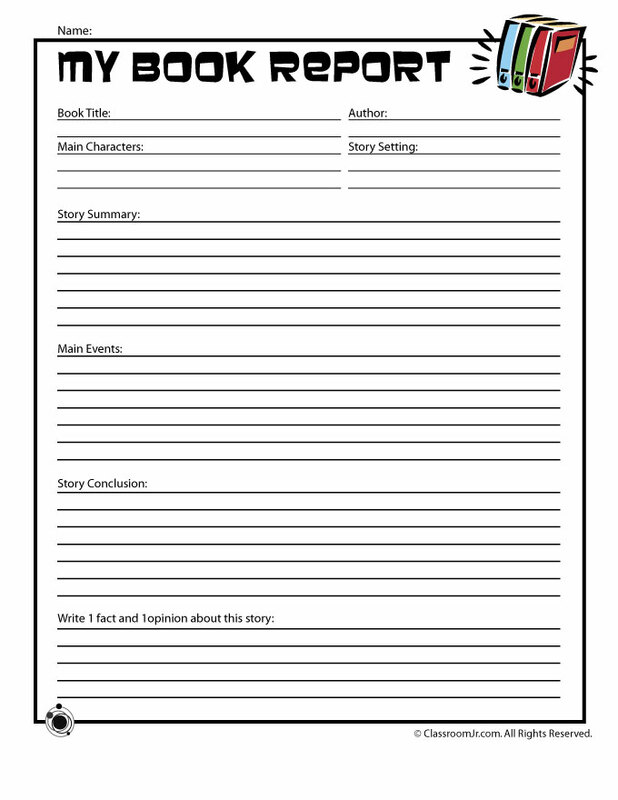 Writing a book report does not have to be too complicated. It can even be as simple as the ones found above. Keep in mind that the simpler and more colorful your book report is, the better it is. You may also see employee reports.